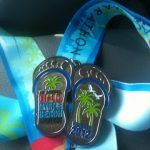 ‎“It’s very hard in the beginning to understand that the whole idea is not to beat the other runners. Eventually you learn that the competition is against the little voice inside you that wants you to quit”. Wow wow wow. Yesterday was a learning experience in so many ways. I don’t even know where to begin. 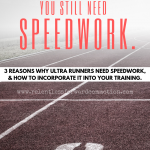 If I wasn’t so sore, I’d go for a nice long run to sort it out…most of my best blog posts come to me on a good run! And while I have a lot to share about the whole weekend, I’m just going to start with the half marathon itself while it’s fresh on my mind. Yesterday morning, I met up with my little sister and drove over to the start of the Myrtle Beach Mini Marathon at Medieval times. We visited the porta potty, visited the horses in their stables, and watched some knights in shining armour joust. Gotta love pre-race entertainment! I was nervous, but not nearly as nervous as I had expected to be. 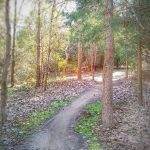 I was more of a wreck 48 hours prior, but I think I had come to terms with my race plan….either I was going to do it or I wasn’t. No need to be nervous. Just do it. I met up with my friend Christine. A sub-3 hour marathon herself, she had volunteered to pace me to a PR. 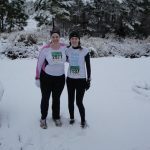 She genuinely had more faith in my capabilities as a runner than I did, and as doubtful as I was about it (on my part, not hers! ), I took her up on the offer to get me to a 1:50 half marathon. 8:23/mile pace. Fortunately, we didn’t wait around too long, so I didn’t have time to start freaking out. Here goes nothing. Mile 1 – 8:46: Ahh open corrals. We started in the 8:00-9:00/mile corral, though it seems most people in this area were running 9:00-10:00/miles. LOTS of weaving in, out and around slower runners. It was probably a good thing though, as it allowed my body to warm up. Mile 6, 7, 8 – 8:13, 8:14, 8:19 – Hit the unofficial 10k PR in 50:52 (previous 10k record is 51:20). Started to feel the burning in my quads. We passed a 13 year old named Emma and her dad. Emma was running her first half marathon (and she was cruising, passed us later on!) We congratulated her, and I told her when I was 13, I DREADED running the one mile in gym class. So she was way ahead of me already. Haha! Somewhere around mile 8 I put a cliff block in my mouth and after a few seconds spit it right back out. When you really start breathing hard, sticking one of those big clunky blocks in your mouth took way too much effort. I nearly gagged on it. Bye bye race nutrition. (for future races, I plan to cut these things in half pre race, and carry them in a plastic baggie). I felt my mind starting to creep in and remind me of how much my legs were starting to hurt. My breathing was no longer easy and steady, but becoming a bit labored and inconsistent. Christine noticed, and told me to stop talking, she would do all of the talking from here on out. The night before she had asked me to think of 5 things I am thankful for and 5 people who are struggling more than I am at that moment. She started calling on them now, telling me to visualize them, to gain strength from these people. Mile 9,10,11 – 8:22, 8:38, 8:42: I never walked. Not once. But around mile 9 my breathing started to get the best of me, so I told Christine that we needed to slow down. Just for about a minute or so at a time, we would slow down to the 9:30 ish pace, catch my breath, and pick it back up. Oddly enough, when I’d slow down, though I’d catch my breath, my legs would hurt that much more. Christine continued talking me through visualizations. Mile 12, 13 – 8:55, 8:55; Ow, ow , ouch, ow. My legs were on fire. I realize now that I’ve never, I mean never pushed myself this hard. Because I’ve never felt that type of burning in my legs before. I couldn’t help but wonder how they were even moving, but they were. (and on a side note, I didn’t mention it to Christine at the time, but I realize I WAY chickend out on my VO2 max test last year and called it quits way too soon. Seriously, I clearly freak at the first inkling of “wow this is hard”) But the sore quads isn’t what got me at this point. I was dizzy. I think it was a combination of coming in and out of sunny patches (I mean, sun in the eyes blinding) to shaded patches, (silly me forgot glasses or a hat) and remember the spitting out of the cliff block before mile 8? That was the last time nutrition passed my lips (other than half a sip of Gatorade). I was bonking and I was bonking bad. Low on fluids, fuel, and electrolytes. Bonk, bonk, bonk. I knew better, but in the heat of the race you tend to forget. And now that voice in my head was getting the best of me. “quit. Walk. This is so hard!” it was taunting me. I remember at one point telling Christine “please do not let me walk”. Thank goodness she was by my side, because I honestly can’t say that I wouldn’t have stopped if she hadn’t been there. 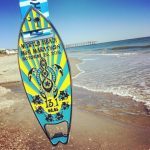 These last miles were on Ocean Boulevard, so I KNEW we were close. But sometimes, knowing you are so close just makes the race SEEM that much harder, and make the miles seem to drag out even further. I had to slow my pace down quite a few times to get through the dizzy spells. Christine was a saint! Seriously, I do not think I could thank her enough for what she did for me yesterday. She kept telling me that I was GOING to do this, she would NOT let me quit. She kept telling me I was a strong runner. I HAD this. She was yelling at the spectators (no really, yelling at them, I don’t know what was with the spectators at this race but clearly 99% of them hadn’t had any form of caffeine that morning), telling them to cheer for me, this was hard work! And she kept telling people I was about to PR. I couldn’t smile on the outside, but it made me smile on the inside. I know how I felt at that point, so I can only imagine how I looked. I remember at one point she said to me “remember, you aren’t going to actually physically die from this”. I giggled a little. I must have really looked awful! We finally came to the last corner and turned onto the boardwalk for the last four-tenths of a mile. WORST PART OF THE RACE! While I’m sure it took less than 5 minutes, it felt like 30. I couldn’t physically see the finish line, and I was convinced it wasn’t where I initially thought it was. This part of the boardwalk is a giant serpentine/S-shaped path. At that point, the dizziness combined with all of the zig zagging had me just spent. I seriously lost it. I didn’t even want to look up. I just kept looking at the ground and giving it what I could. Christine tried so hard to push me that last stretch but I can honestly say, I felt like I had nothing left. All I could do was grunt, whimper, and eek out a “where is the damn finish line!!??”. She even told me she’d catch me if I fell, but just keep running! Looking back, I realize this was probably 75% nutrition (and I hadn’t even finished 75% of my 20 oz water bottle…oops), 25% just lack of strength and training. Finally, FINALLY we hit the straight part of the boardwalk and the finish line was in sight. Somehow , I managed to sprint (if you can call it that) across that finish line. 1:51:16. That’s an 8 minute 15 second PR. I don’t really remember the next few minutes. I knew there was a hug from Christine and my friend Dawn who had beat us to the finish line, and I remember feeling completely exhausted and utterly proud of myself. My mind is by far my biggest opponent. Hands down, no contest. Sure, I need to get better at following my training plans. (I hit all but one long run for this half marathon training, but missed a good part of the mid-week runs. ) Sure, I absolutely need to focus more on strength training (my quads were KILLING me!) But above all, I need to work on telling my mind to SHUT THE H*LL UP! If Christine wasn’t with me yesterday, I can almost promise you I would have certainly slowed my pace down a lot more, and probably would have walked a few times in the end. I hurt that bad. But at the end of the day, I DIDN’T stop and walk, which proves to me that my body is much stronger than my mind gives it credit for. And afterall, that sort of pain is temporary. I survived, without walking, and other than some sore legs, I am no worse for the wear. So even though my mind was screaming “you NEED to walk now!” clearly, I didn’t NEED to. But Christine, or any other pacer, won’t always be there with me. So now, I just have to work on getting the mind and the body both on the same page. Yesterday I ran faster than 87% of the people on the course, men and women combined. I ran faster than 94% of women on the course, and faster than almost 90% of the other females my age. I’m certainly not heading to the Olympics, but it shows me that I am not a BAD runner. I never dreamed I could be a DECENT distance runner, but maybe, just maybe, I do have that in me. So that’s where I’m at. I’m proud of myself. 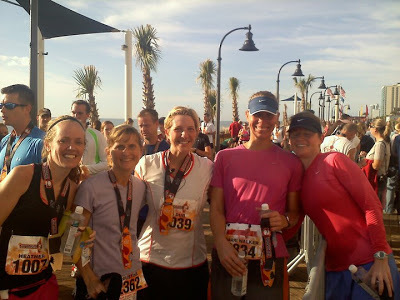 I’m EXCITED to begin marathon training for the Myrtle Beach Marathon in February. I have a great group of local runners I’m going to train with. And I’m going to really, really focus on sticking to my training plan. I’ve picked one that’s not too intense so I don’t burn out, but thorough enough that I believe I can meet my goal: a 4 hour marathon. And I’m ready to learn to push through the discomfort. *whew*. I’m sure I have SO MUCH more to say on this subject, but my mind, just like my quads, is exhausted. I also have so much more to share, from pictures of this weekend (including the 5k, doggie dash, and high heel run), the winner of the allied medal hanger giveaway, and some really exciting news about that Landice treadmill I really wanted to win 🙂 Stay tuned, and thanks for reading this really long post! Great job Heather! 8-plus minutes is a huge PR–love that it gave you confidence. Enjoy the moment. Congrats on a huge PR and really pushing yourself – way to go!!! The mind and the limits we put on ourselves are the toughest to overcome. Great job! Great report Heather. Hate that I didn’t get a chance to say hello. There will be other races for us to get a chance to meet up. Until then! isn’t it ironic that our biggest hurdle is often ourselves? Way to go – great race! Congratulations on a huge PR and a huge mental victory! You’ve made huge progress but I know you can do more. Focus on your mind and your nutrition and I’d be willing to bet you’d not only make your marathon goal time but you’d crush it. Relax with a day or two of recovery then get back out there knowing you CAN and WILL do it. You did great! 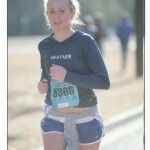 I did the race too and the end was tough…especially once the sun was out in full force! You will do great in the marathon in February! congrats on the PR heather!!!!! loved reading the recap and love your mindset!!! Congrats on your new PR! You did awesome! Way to push through! WoW! Awesome job! I wish some day to be able to run like that. Currently I am struggling to be able to run faster than 11:30 miles. But, I know I’ll get there! CONGRATS SISTER! So PROUD of you for your PR and in awe of those mile splits and knowing how hard you pushed yourself physically and MENTALLY! I read your report and thought well damn if Heather can do her nearly 1:50 goal than I need to hunker down and get back to my sub-30 5K goal again…cause you know she would *pace* you to that PR if you ask her too! 🙂 but don’t worry – not before your 4-hour Marathon effort this February because I will be gunning for a sub 2:30 Half on that day myself. Congrats on a huge PR! Very inspiring Heather! Congrats on a great race! 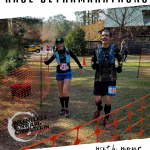 Flippin’ awesome race report! Great race! Way to go on the PR – awesome!! Great job Heather! I love the huge medal! Loved reading your recap! I’m new to running and the running community, but I absolutely love that most of what I read is about competing with yourself. Love that! I had lots of mental battles in the 5k on Saturday & realized how much mental strength is needed to better our best. Congrats! You did awesome! I know my mind is my biggest hindrance. I hope I can overcome it too! wow…good job pushing through. battling my mental demons is the hardest part of running for me too. and WHOAAA…thats a freakin HUGE medal….love it! Awesome! Great job, and great recap, thank you! Way to go Heather!! Great job on pushing through and what a huge PR!! What a great recap! I felt like I was right there with you; burning quads and all. How cool to have Christine coaching you through those tough miles. Your finishing time is fantastic! Congrats on the HUGE PR. That medal is ginormous!! Way to go on a PR!! It is so true that you need to tell yourself to Shut it! I find I need to do the same thing! It helps to have someone pace you so that you can see what you can actually do. From then on it is up to you to push yourself to that level since you know you can and not die! Way to go!!! Wow!! You are such an inspiration! Great job on pushing yourself out there and congrats on the PR!! way to go!! love that medal! those shot blox are huge – i know what you mean. congrats on the pr! 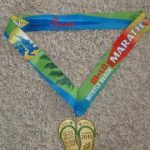 I simply love this line; “It’s very hard in the beginning to understand that the whole idea is not to beat the other runners. Eventually you learn that the competition is against the little voice inside you that wants you to quit”. Way to go! 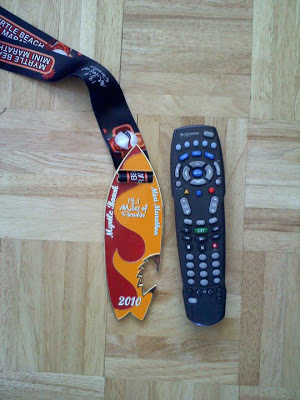 Pass the running medal – I mean remote. Woohoo! Congrats on an awesome race and a new PR! Yay! You did so great! Great idea to cut the Chomps in half. I always bite them in half and hope I don’t drop it. Congratulations on such a great PR! Way to make it happen. I love the end of your post … Believing in yourself is so important! “It’s very hard in the beginning to understand that the whole idea is not to beat the other runners. Eventually you learn that the competition is against the little voice inside you that wants you to quit”. You are amazing! Congrats on your new pr. That medal is ridiculous. I’ve been dying for you to finally spill it about the treadmill. Don’t you just love that medal – makes the burn worth it. I am no where near as fast as you 2hr 54min 48secs but a PR for me at 54yrs old. You give me inspiration. Wow! If that doesn’t boost your confidence in yourself then I don’t know what would. Fantastic job, Heather!! Congratulations!! Great race report and Congrats on your PR!! WOW, incredible PR. You worked hard and did an amazing job. Oh, and could I borrow Christine for a weekend – hahaha. Now you know in your mind that you can do it. Awesome! That’s a nice PR! Yay! I laughed when I saw the medal. I personally like dual function race medals.